NEW YORK (AP) — Michelle Obama's memoir, one of the most highly anticipated books in recent years, is coming out Nov. 13. The former first lady tweeted Sunday that the book, to come out a week after the 2018 midterm elections, is called "Becoming." She and her husband, former President Barack Obama, last year reached a joint agreement with Penguin Random House for their respective books. The deal is believed to be well in excess of $30 million. "Becoming" will be released through the Crown Publishing Group, a Penguin Random House division that has published works by both Obamas. 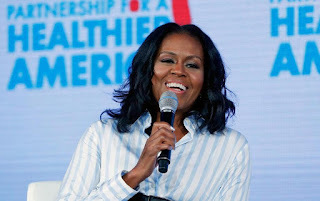 The book will be published simultaneously in 24 languages, from Swedish to Arabic, and Michelle Obama expects to promote "Becoming" in the U.S. and overseas. She will also narrate the audio version. "As first lady of the United States of America — the first African-American to serve in that role — she helped create the most welcoming and inclusive White House in history, while also establishing herself as a powerful advocate for women and girls in the U.S. and around the world," Crown said in a statement.